Kayak fishing is fishing from a kayak. The kayak has long been a means of transportation and a means of accessing fishing grounds. Kayak fishing has gained popularity in recent times. Kayaks (Inuktitut: qajaq, Inuktitut syllabics: ᖃᔭᖅ) were originally developed by indigenous people living in the Arctic regions, who used the boats to hunt on inland lakes, rivers and the coastal waters of the Arctic Ocean, North Atlantic, Bering Sea and North Pacific oceans. These first kayaks were constructed from stitched animal skins such as seal stretched over a wooden frame made from collected driftwood, as many of the areas of their construction were treeless. Archaeologists have found evidence indicating that kayaks are at least 4000 years old. The oldest still existing kayaks are exhibited in the North America department of the State Museum of Ethnology in Munich. These manufacturers offer special models for fishing that are designed and accessorized for this sport, including specially designed hatches, built-in coolers & rod holders, gps receivers and equipment mounts. Other accessories include live wells, anchor trolleys and running lights. Specially designed fishing kayaks usually have designs similar to those of recreational sit-in and sit-on-top kayaks characterized by very wide beams (up to 36 inches) that increase lateral stability. The increases stability allows for the angler to stand up and fish on the kayak. These kayaks provide a considerable space for storage inside their hulls which allow the angler to stow rods, fishing gear, batteries for fish finders, extra paddles, anchors, and wheels to tow the kayak from vehicle to the water. The cutouts molded into the top of the kayaks are well-suited to hold milk crates with additional supplies. Some anglers equip their fishing kayaks with outriggers to further increase stability. In recent years people have begun using kayaks for fly fishing, most models suited for upright fly casting include upright braces that allow you to safely stand up. The most popular kayaks for fishing are rotationally molded from polyethylene due to their durability and lower cost. Hard shell kayaks are preferred over inflatable kayaks, since they are not susceptible to lure punctures. Generally, kayak fishermen look for stable, durable and comfortable designs. The new generation of twinhull (catamaran) kayaks that was recently introduced into the market is stable enough to enable both paddling and fishing in the standing position. This technological development also solves some ergonomic problems that are associated with sitting for long hours without being able to change positions, and frees kayakers from the need to sacrifice speed to stability, which is another problem that characterizes monohull kayaks. Kayak Fishing has taken off dramatically in South Africa. Game fish are caught along the coastline North and South of Durban. Large fish such as Marlin and Sailfish can be caught. On the east coast of the United States, the kayak is quickly becoming a favorite method for accessing fishing spots in the Chesapeake Bay and the Intercoastal Waterway. Inuit seal hunter in a kayak, armed with a harpoon. Contemporary kayaks can be equipped with after-market fishing accessories such as anchor trolleys, rod holders, electronic fish-finders and live-bait containers. Kayak anglers target highly prized gamefish like snook, red drum, seatrout, tarpon, halibut and cod and also pelagics like amberjacks, tuna, sailfish, wahoo, king mackerel, and even marlin. Another popular method of fishing from kayaks which has emerged is that of softbaiting. This involves weighted jigheads and rubber or plastic soft lures in the shapes of baitfish. This method is the predominant method now used, particularly in the Southern hemisphere, as it reduces the need to take messy livebaits on board the kayak. Some anglers launch kayaks from larger boats well offshore so they can fish from the kayak. They find much excitement fighting a game fish as it pulls the kayak through the water. Recently kayak fishing has started to move inland to freshwater lakes and rivers, where anglers target gamefish like largemouth bass, smallmouth bass, trout, muskellunge, and salmon. Some of the biggest benefits of kayak fishing are in the ease of use and transportation, the affordability of the equipment compared to motorized boats, they're an eco-friendly watercraft, and they provide fun and exercise. ^ Braud, Eli. "Bridge Side Marina Saltwater Bay Fishing Spot and Kayak Launch in ,". YakAngler.com. ^ Review: Hobie Outriggers Hot 1 August 2011. ^ Various Kayaks For FlyFishing 20 November 2013. ^ "Outdoor Gear Up". outdoorgearup.com. Retrieved 28 May 2016. ^ faulk, zane. "Colonel Island Saltwater Marsh Fishing Spot and Kayak Launch in ,". YakAngler.com. ^ "Kayak Fishing and Softbaits - the perfect combination! - The Fishing Website". The Fishing Website. 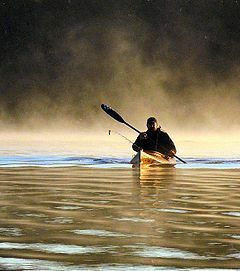 ^ "Kayak fishing from a mothership - The Fishing Website". The Fishing Website. This page was last edited on 20 January 2019, at 23:30 (UTC).